Another popular tradition combined with Gall's system in Britain was the doctrine of temperaments or humours. These traditions date back at least to classical Greece and are especially associated with the medicine of Galen. They were based on the belief that Nature was made up of combinations of four elements (earth, air, fire, and water), and qualities (hot, cold, wet and dry) and perhaps also the significance of the number four itself. So the human body also had four essential fluids: blood, phlegm, yellow bile and black bile, which determined the prevailing temperament. 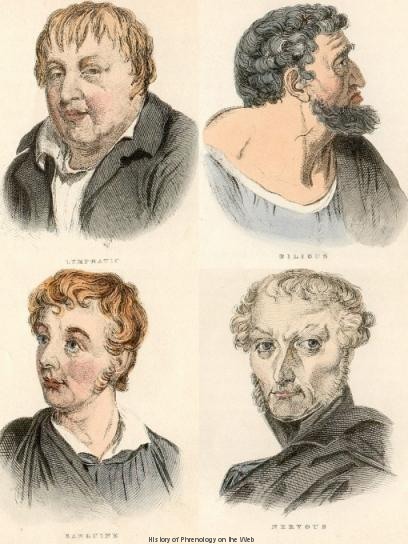 The four temperaments were characterized both by the fluid element and its physiological and physiognomical effects. The dominance of a humour indicated a characteristic disposition: blood meant sanguine, preponderance of phlegm meant phlegmatic, yellow bile choleric, and of black bile melancholic. These traditions were largely medical and therapeutic and enjoyed wide popularity across Europe in the late eighteenth and early nineteenth centuries. They were used to explain susceptibility to disease and prominent character traits. 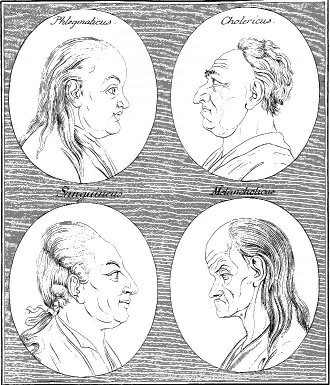 Recognizing temperaments was also part of Lavater's physiognomy. (See Lavater illustration ) In phrenology they became an important part of character diagnoses in addition to head-reading from 1826. From Combe's System of Phrenology. "There are four temperaments, accompanied by different degrees of strength and activity in the brain-the lymphatic, the sanguine, the bilious, and the nervous. The temperaments are supposed to depend upon the constitution of particular systems of the body: the brain and nerves being predominantly active from constitutional causes, seem to produce the nervous temperament; the lungs, heart, and bloodvessels being constitutionally predominant, to give rise to the sanguine ; the muscular and fibrous systems to the bilious; and the glands and assimilating organs to the lymphatic. The different temperaments are indicated by external signs, which are open to observation. The first, or lymphatic, is distinguishable by a round form of the body, softness of the muscular system, repletion of the cellular tissue, fair hair, and a pale skin. It is accompanied by languid vital actions, with weakness and slowness in the circulation. The brain, as part of the system, is also slow, languid, and feeble in its action, and the mental manifestations are proportionally weak. The second or sanguine temperament, is indicated by well defined forms, moderate plumpness of person, tolerable firmness of flesh, light hair inclining to chestnut, blue eyes, and fair complexion, with ruddiness of countenance. It is marked by great activity of the bloodvessels, fondness for exercise, and an animated countenance. The brain partakes of the general state, and is vigorous and active. The fibrous (generally, but inappropriately, termed the bilious) temperament; is recognised by black hair, dark skin, moderate fulness and much firmness of flesh, with harshly expressed outline of the person. The functions partake of great energy of action, which extends to the brain; and the countenance, in consequence, shews strong, marked, and decided features. ---Mattieu Williams, A Vindication of Phrenology. (1894) pp. 49-50. -J.C. Lavater, Von der Physiognomik, (1772) at Projekt Gutenberg-DE (in German).